Chandrasekhar said Modi had promised to provide jobs to unemployed and get back the black money stashed abroad in banks, if elected to power. 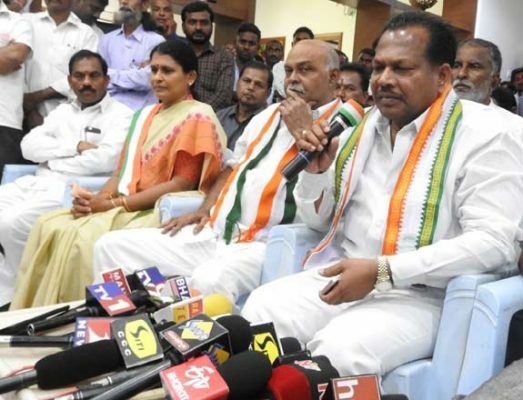 A Chandrasekhar, the Congress party’s nominee from Peddapalli Parliament Constituency at a press conference in Mancherial on Saturday. Mancherial: A Chandrasekhar, the Congress party’s nominee from Peddapalli Parliamentary Constituency (SC), said Prime Minister Narendra Modi had failed to fulfil promises made during 2014 general elections. He was speaking to press persons in Mancherial on Saturday. He was accompanied by District Congress Committee (DCC), president, K Surekha, and former MLC, K Prem Sagar Rao. Chandrasekhar said Modi had promised to provide jobs to unemployed and get back the black money stashed abroad in banks, if elected to power. But, he failed to fulfil his promise. He caused several problems to the public by demonetising high value currency and imposing Goods and Service Tax. The MP candidate said AICC president, Rahul Gandhi would implement minimum income scheme, create employment opportunities for youth and introduce 33 per cent reservations for women in legislative bodies, if Congress comes to power. He urged electors to cast their votes for the secular party, the Congress. The former Minister recalled that he had taken part in Telangana movement and was aware of the challenges faced by Mancherial, Bellampalli and Chennur constituencies. He vowed to develop the region on several fronts by utilising the natural resources available. He assured people to address major problems of the area, if elected. He sought an opportunity to become Parliamentarian. Zilla Parishad Vice-chairperson M Raji Reddy and many other leaders were present at the press meet.